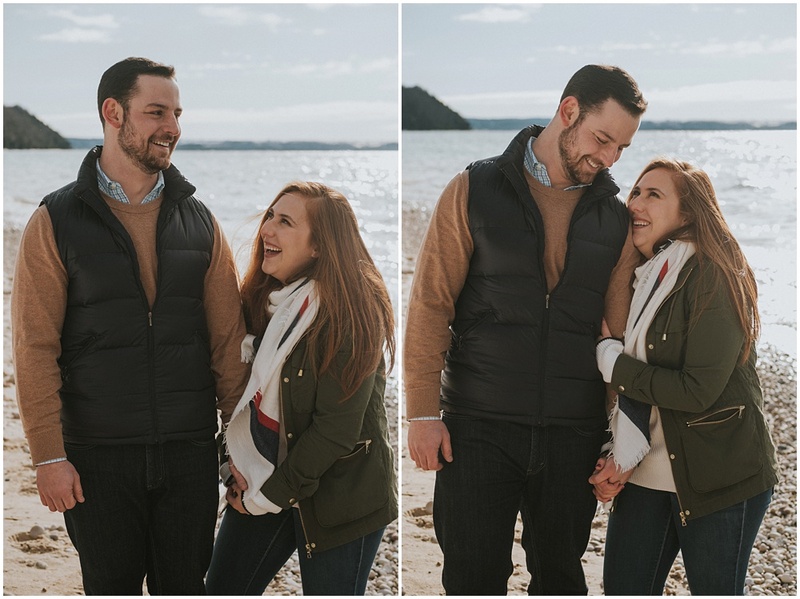 When Thomas and Giovanna contacted me about a winter engagement session in Traverse City, I couldn’t have been more excited! 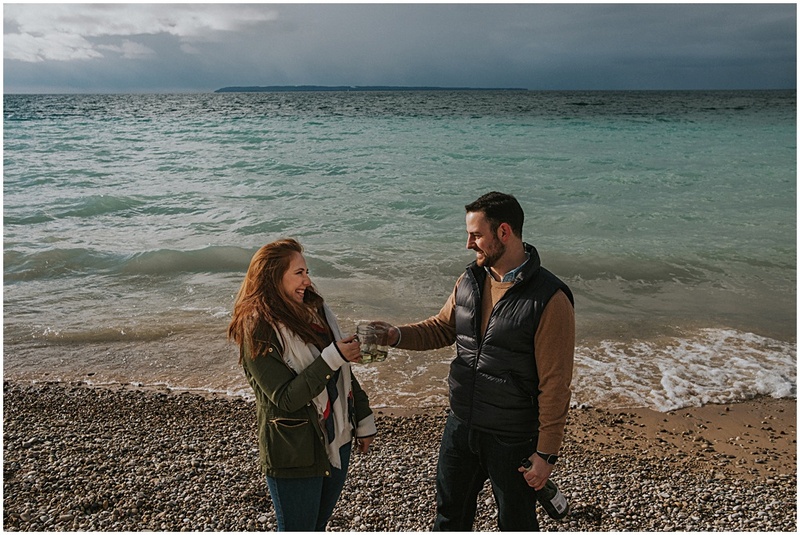 Since moving to Traverse City, I’ve had the chance to adventure all over the Leelanau Peninsula and Sleeping Bear National Lakeshore. And I’ve really grown to love my new home, in all four seasons. 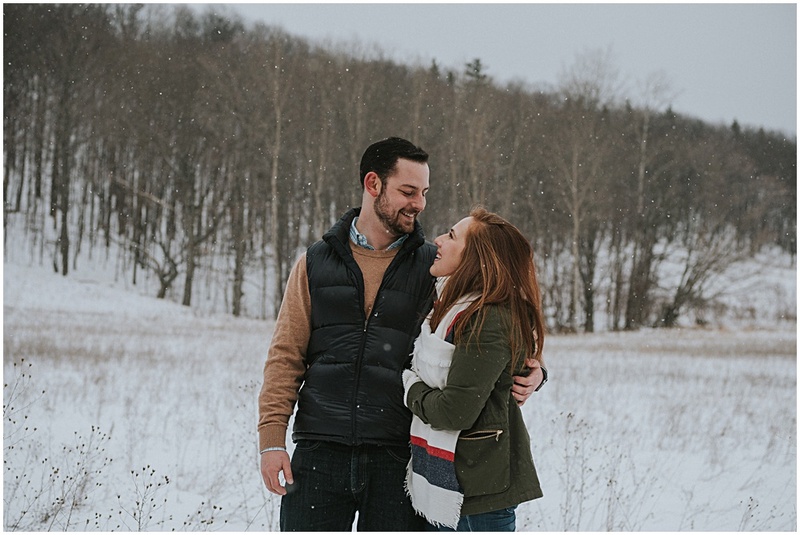 I’ve always enjoyed winter in Northern Michigan. 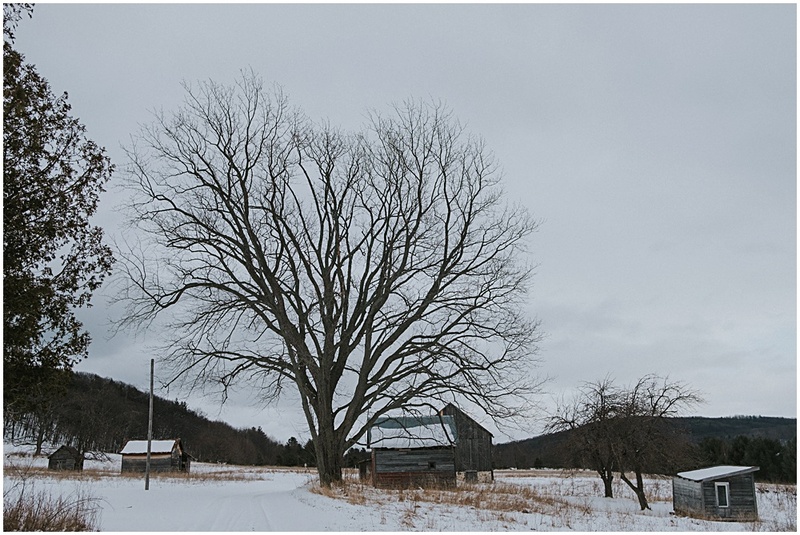 It’s a slower time of year, but there’s still plenty of adventure to be found. 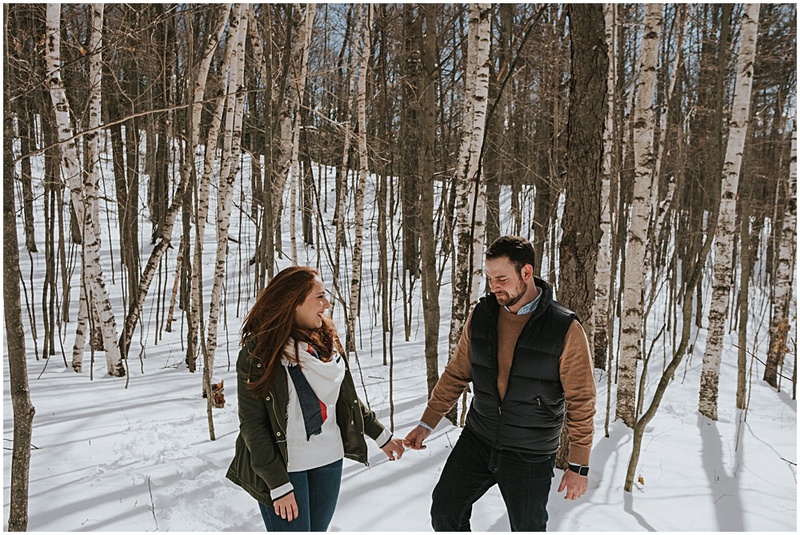 The 120 inches we get in Traverse City brings all kinds of new activities, like snowshoeing, snowboarding, cross-country skiing, and sledding. 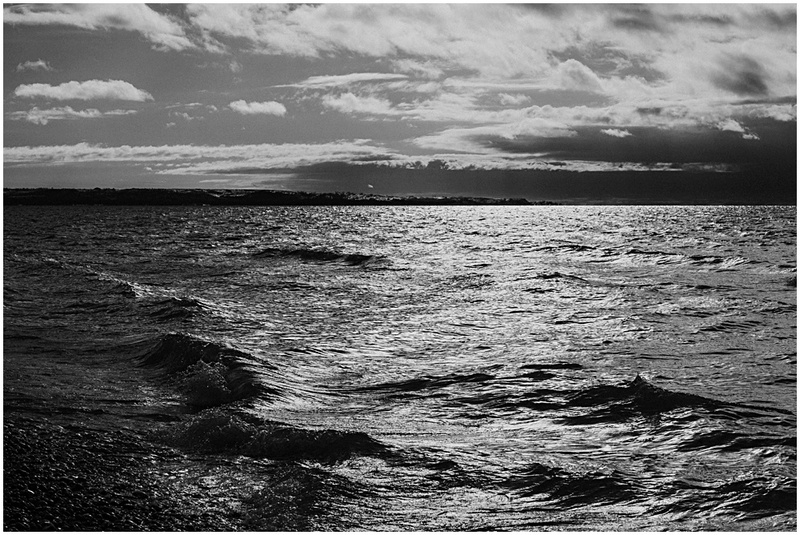 You can check out some of my recent adventures in Traverse City here. 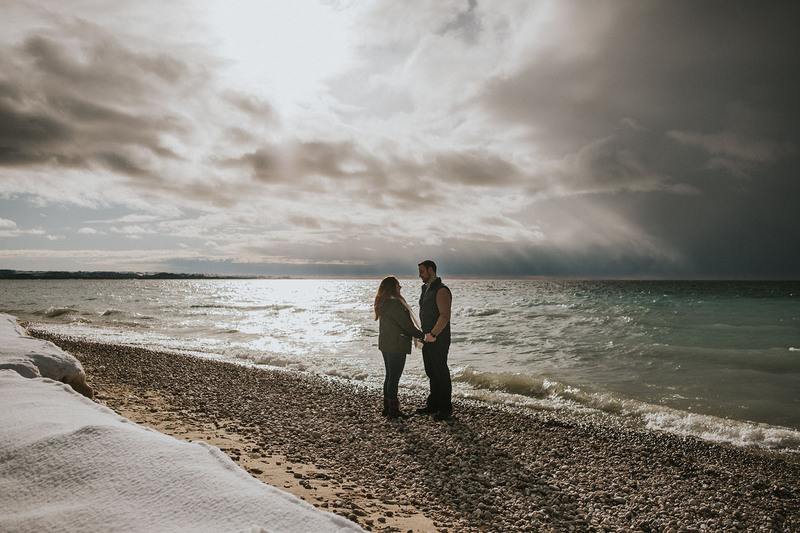 Thomas and Giovanna are new to the Traverse City area. 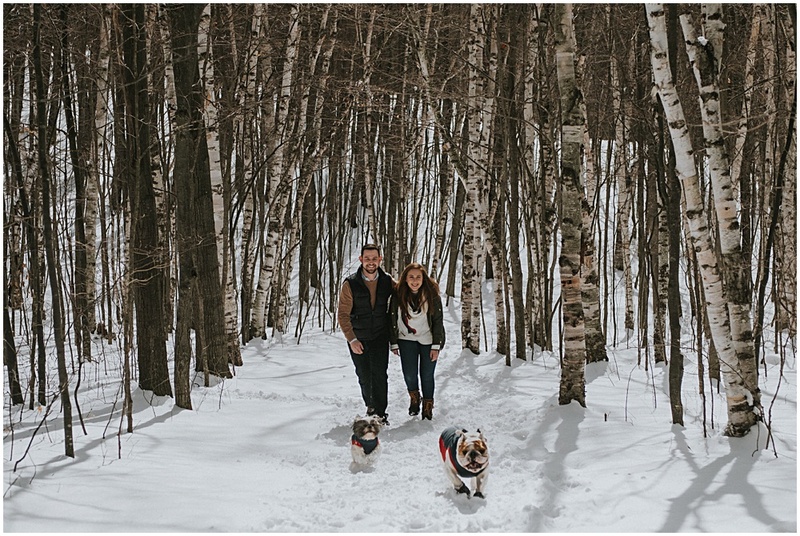 They moved to Northern Michigan last summer with their adorable English bulldog, Pablo and their shitzu, Panfilo. The four make quite a cute family. 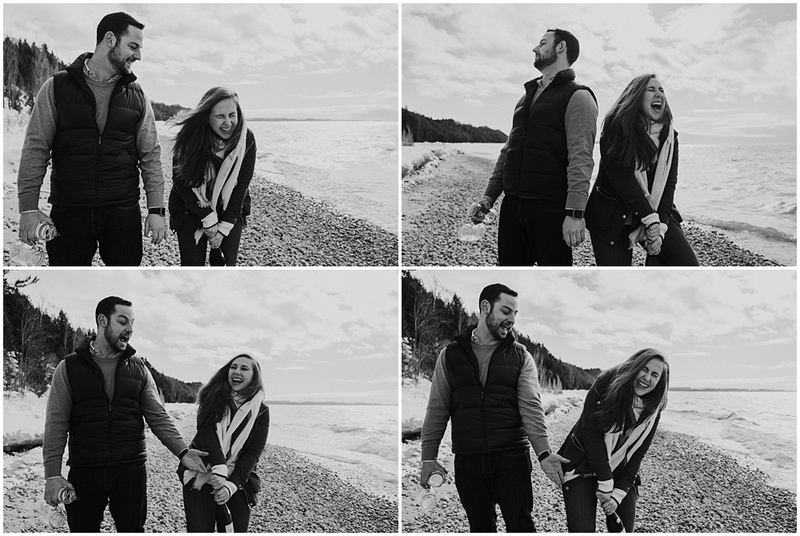 Thomas and Giovanna are always giggling and poking fun at each other. And when they’re out hiking, Pablo is the trailblazer charging full speed ahead and nearly toppling tail over head every time he stops. Panfilo is the more timid one, cautiously following close behind Thomas and Giovanna. 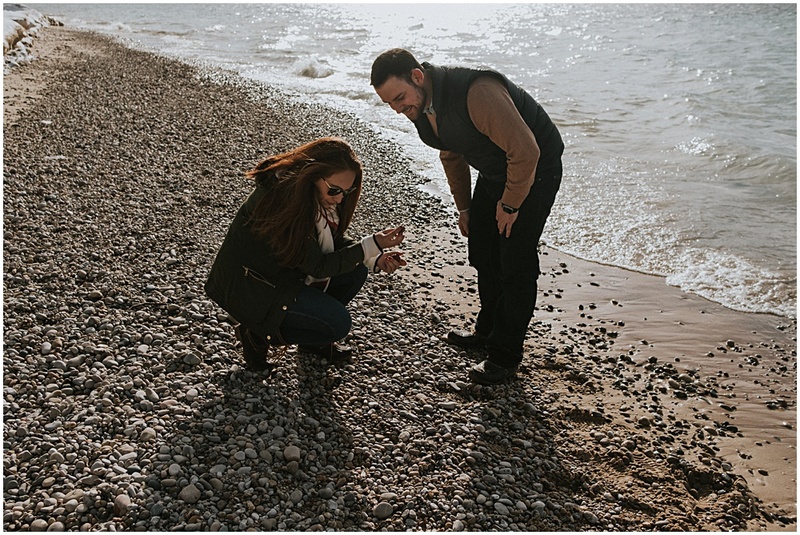 In their spare time, Thomas and Giovanna enjoy vineyard tours and searching for rocks at the beaches along Lake Michigan. 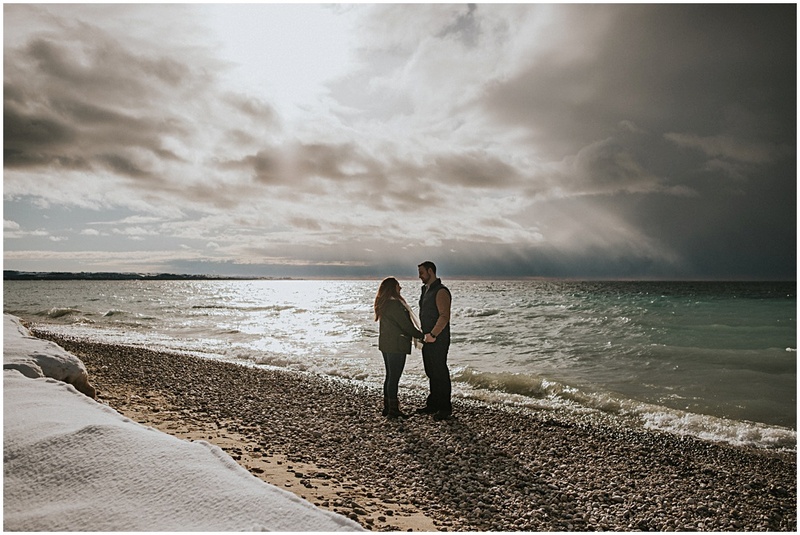 Since the two are new to the area and they hadn’t been to the dunes, I decided to take them to one of my favorite hikes at Sleeping Bear National Lakeshore. 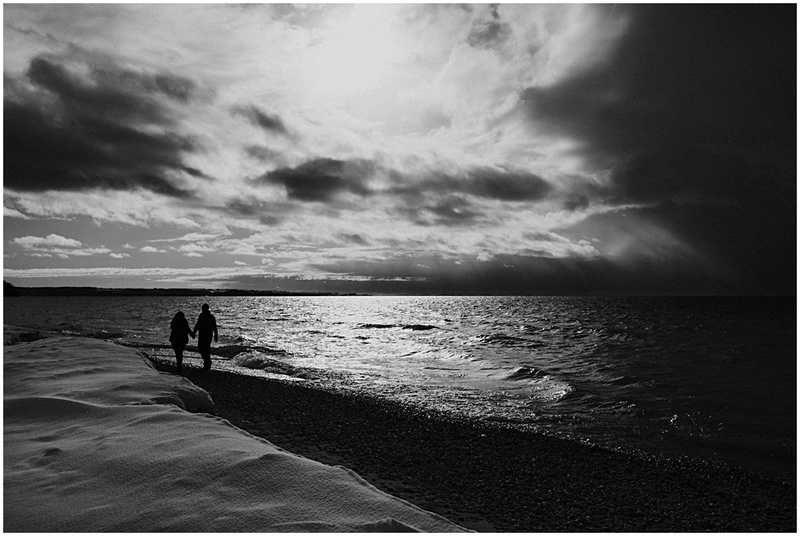 The night before the session we received 4 inches of fresh snow, which made Sleeping Bear all the more beautiful. My sister Alicia was visiting from Chicago and so she tagged along to help me with Pablo and Panfilo. 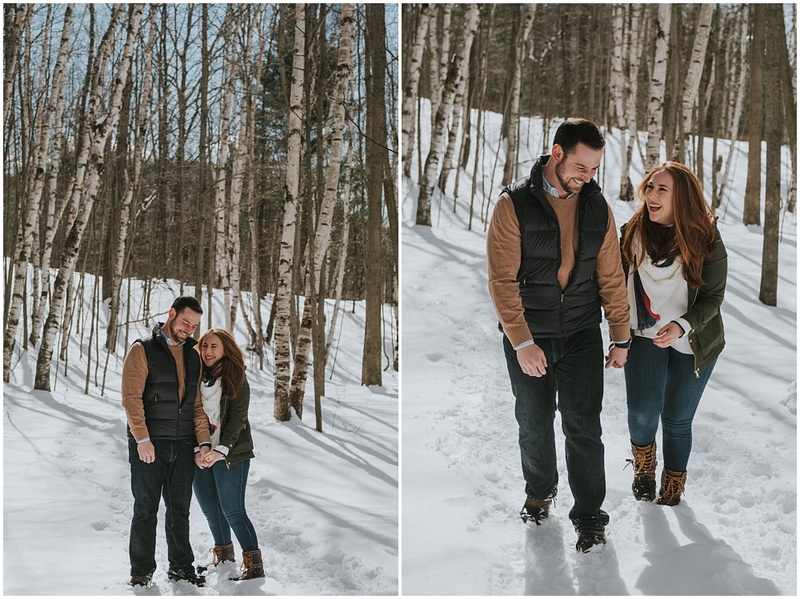 We all set off from the Pyramid Point parking area for Thomas and Gio’s winter engagement session in Traverse City. 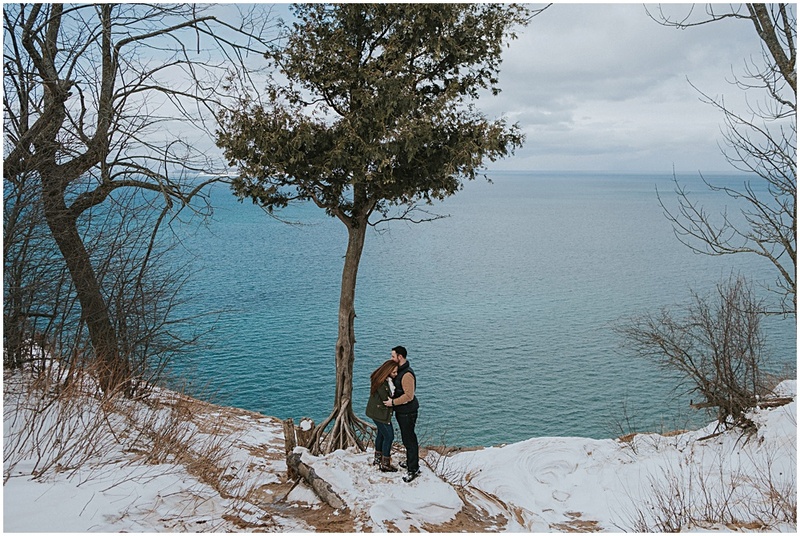 We then our way to a view of Lake Michigan. 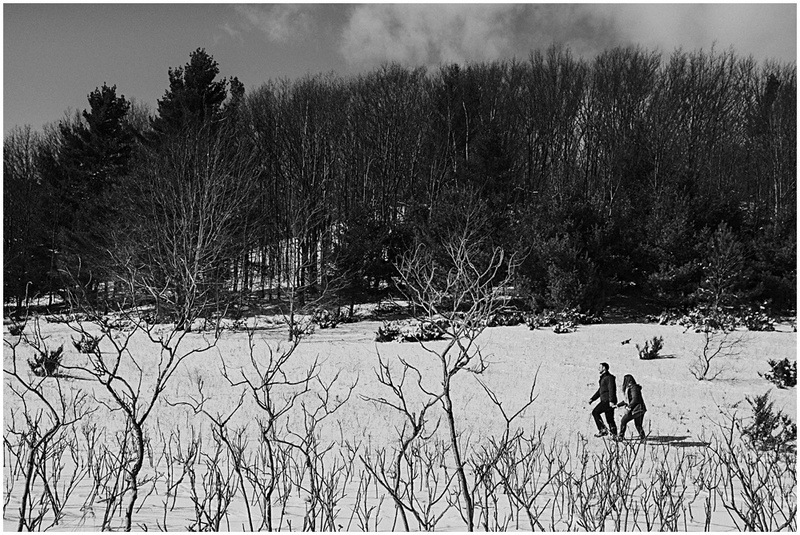 After, we ventured into the woods blazing our own trail and getting just a little lost. 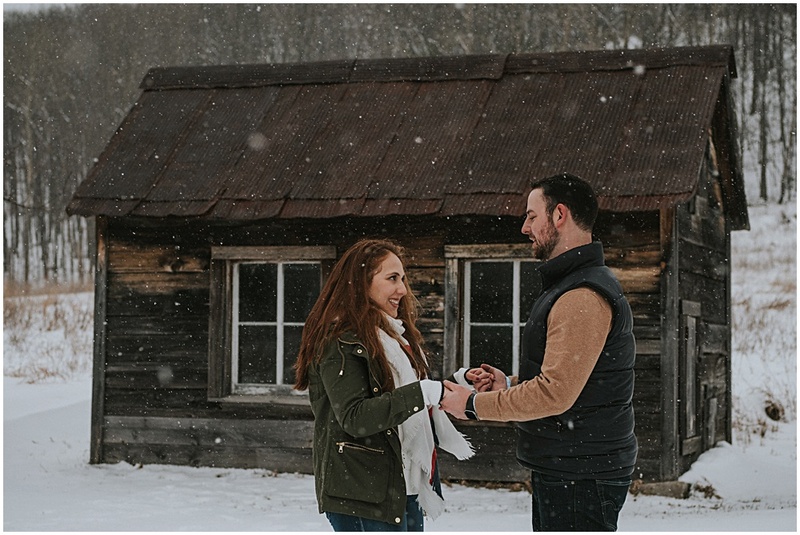 What’s an adventure without a little misadventure? 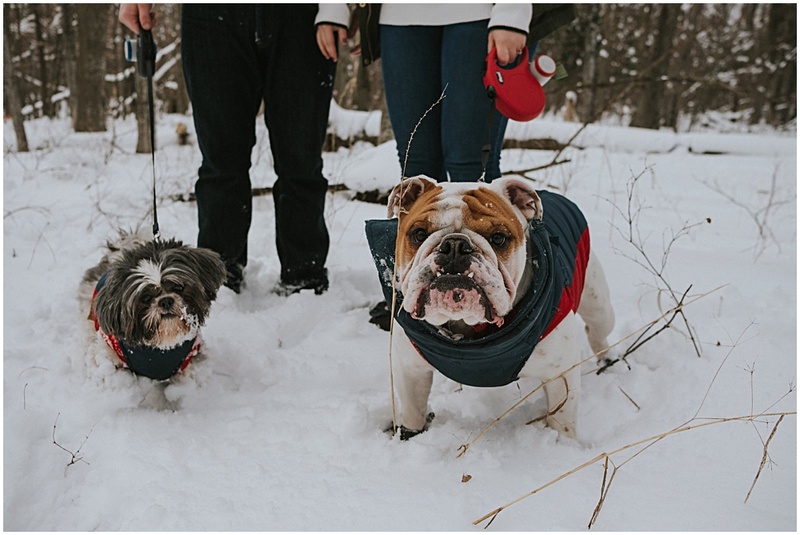 At this point, Panfilo was attracted quite a bit of snow to his paws. 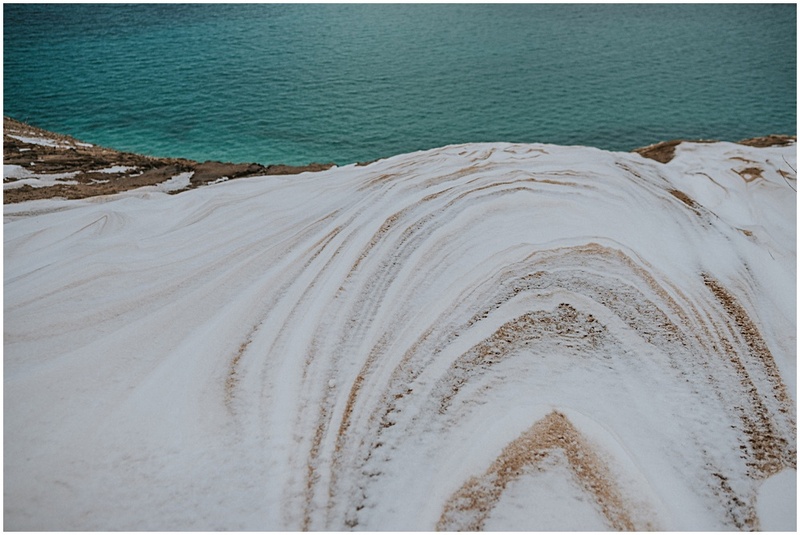 The clumps were so large that they were actually weighing him down. So we headed back to the parking area to let our furry friends warm up in the car and head to our next location. 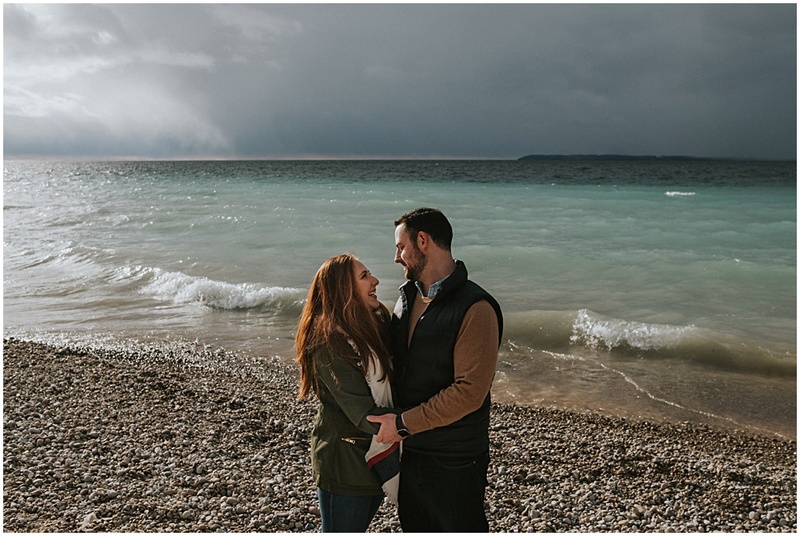 Planning an engagement session in Traverse City? 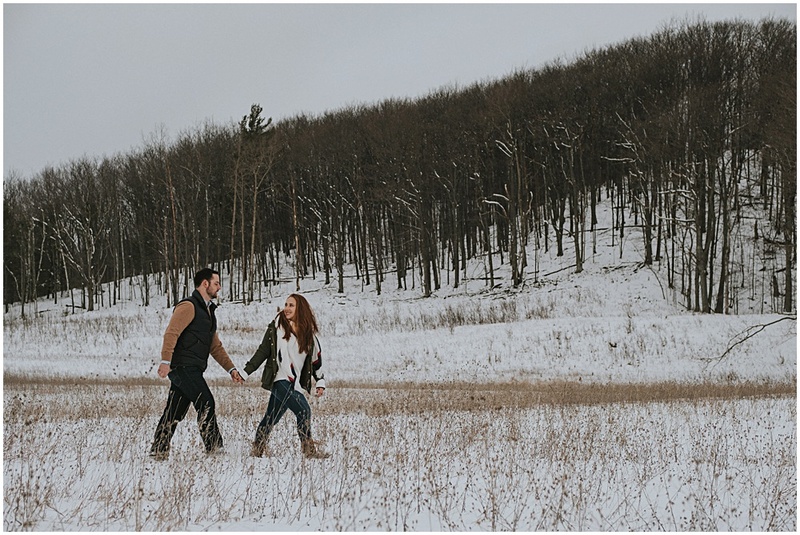 Also check out my springtime engagement session in the Sleeping Bear Dunes. 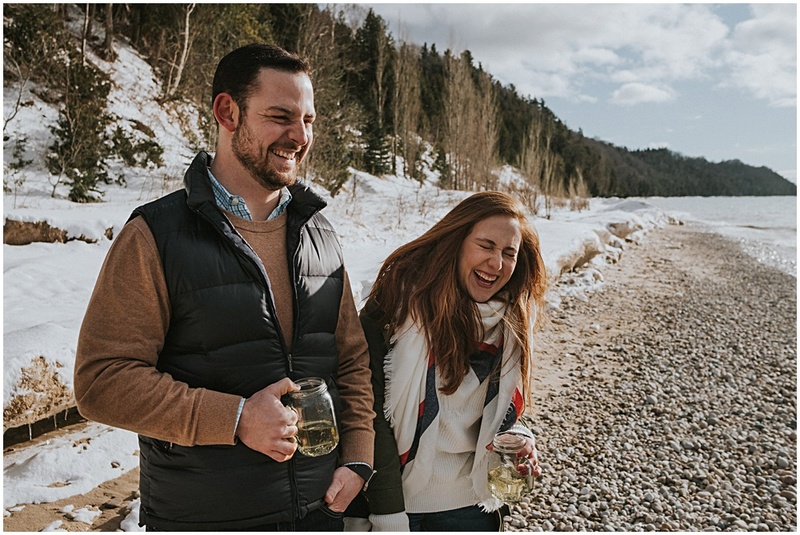 Then we drove down the road to Port Oneida, where Giovanna popped a bottle of champagne after a few attempts. I think Thomas was just a little nervous about losing an eye. 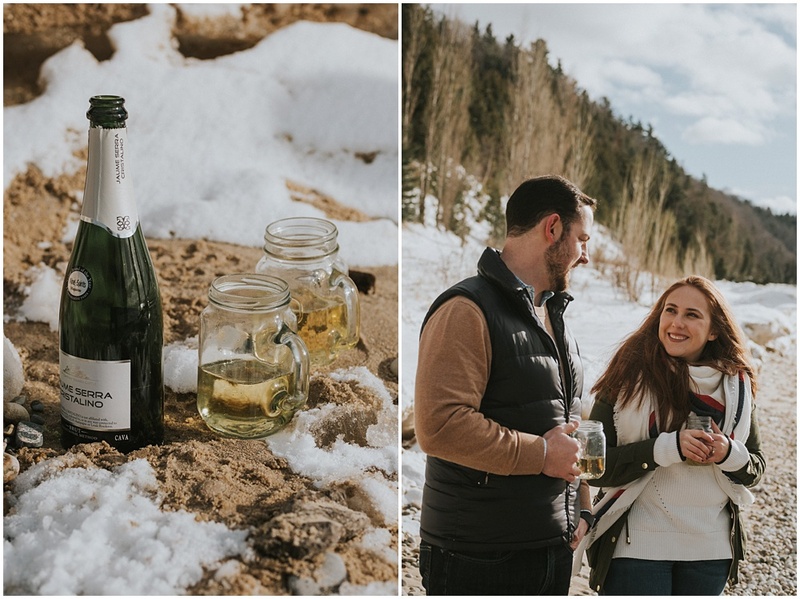 We all had a good laugh and then watched the sun go down as we sipped champagne. 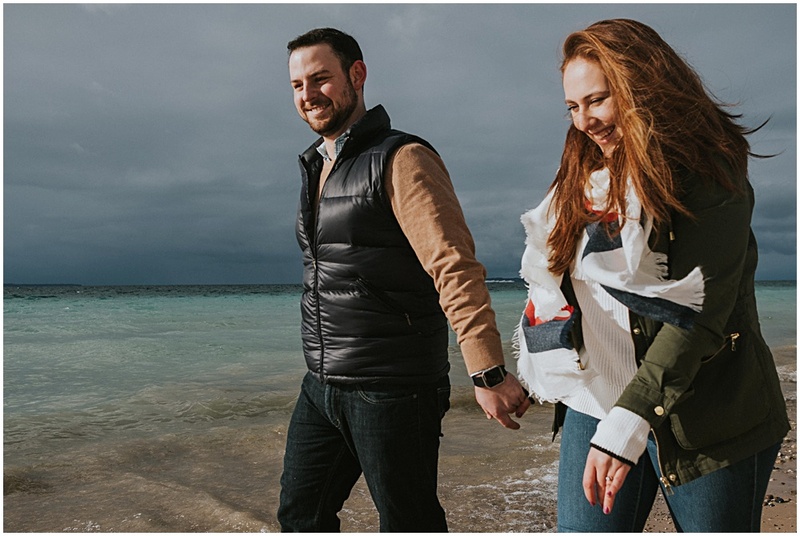 After, Thomas and Giovanna explored the Lake Michigan coast in search of rocks, poking at each other and laughing the whole time. 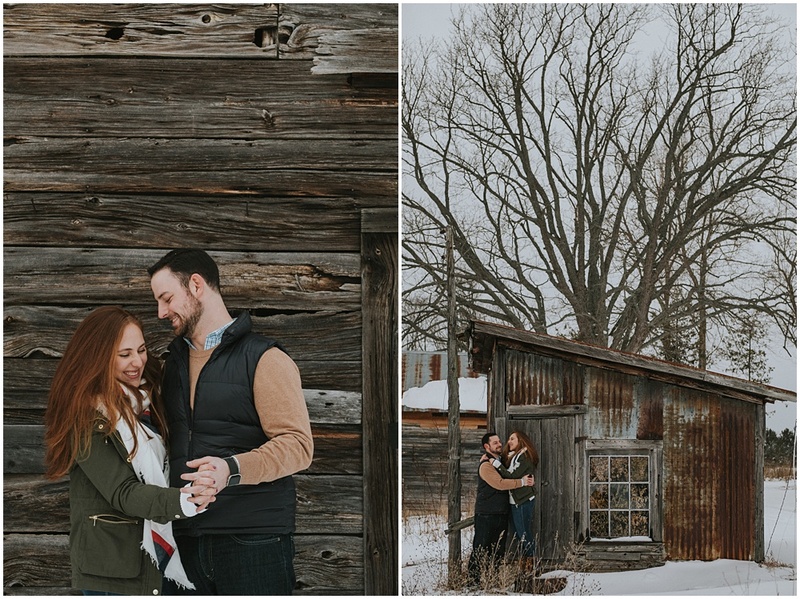 Then it was time for our final location for Thomas and Gio’s winter engagement session in Traverse City. 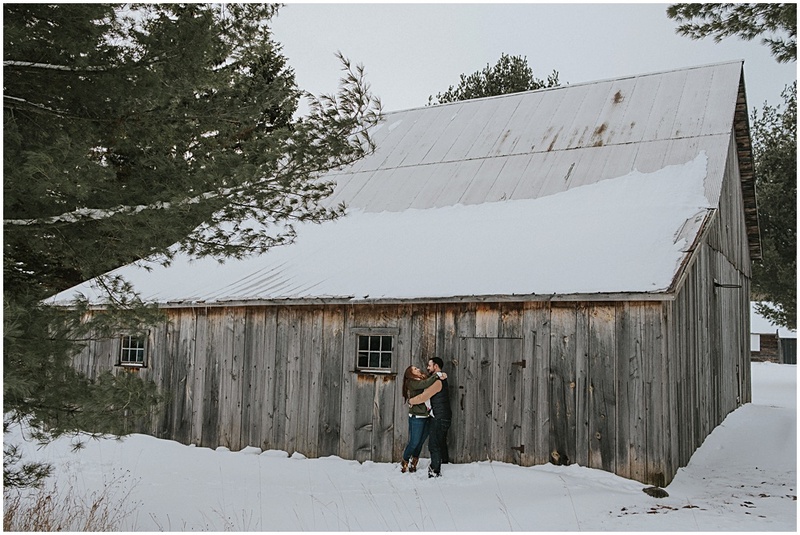 Thomas and Giovanna mentioned that they love all the old barns in Leelanau County. 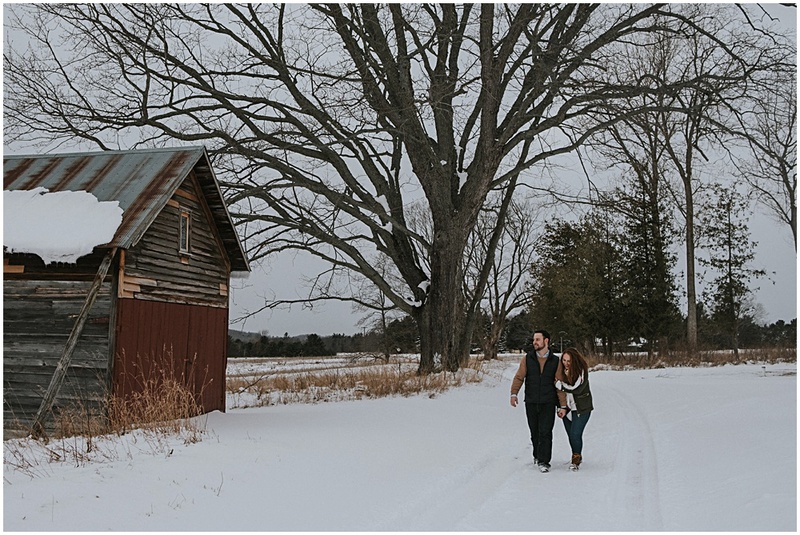 So for our next location, we ventured to some historic barns in Sleeping Bear. 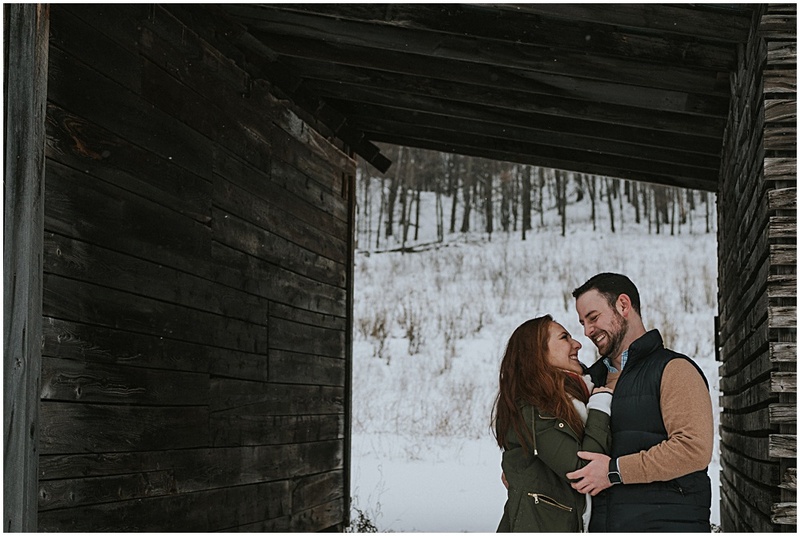 By the time we got to the barns, the sun had disappeared and the snow began to fall. 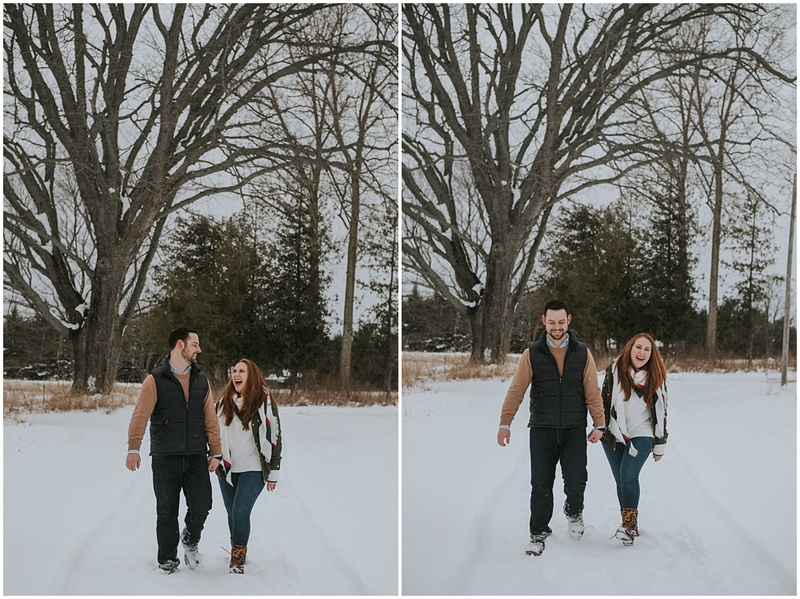 Thomas and Giovanna wandered around the beautiful historic homestead. After, Thomas and Giovanna joined my sister Alicia and I for some drinks and delicious pizza at Red Top Pasteria. I highly recommend the Mackinac Bridge pizza! 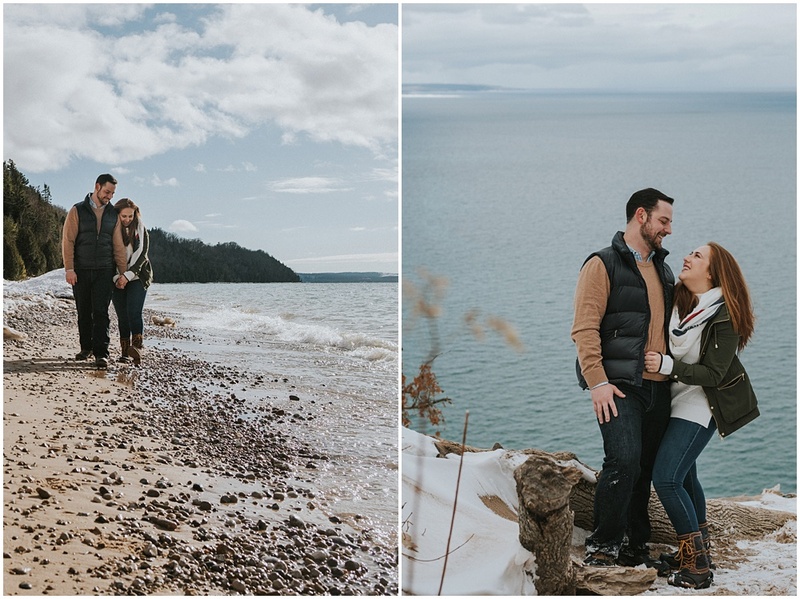 Thanks so much Thomas and Giovanna for adventuring with me and welcome to beautiful Traverse City!